Rick Perry smiled as he left Trump Tower. WASHINGTON (AP) — Former Texas Gov. 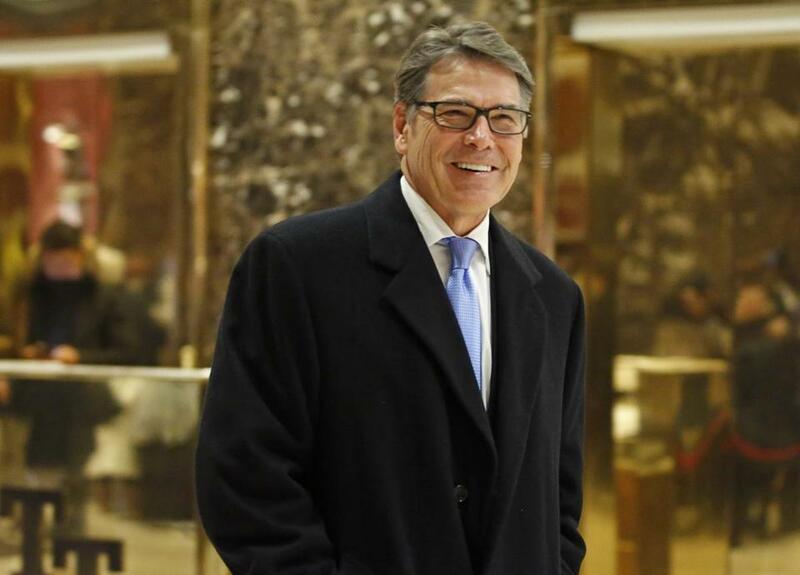 Rick Perry, who famously forgot the Energy Department was one of the agencies he pledged to eliminate, is President-elect Donald Trump’s choice to become energy secretary, two people with knowledge of the decision say. Perry is likely to shift the department away from renewable energy and toward oil and other fossil fuels that he championed as Texas governor. Perry, 66, left office in January 2015 after a record 14 years as governor and then launched his second ill-fated bid for the Republican presidential nomination. He was a harsh critic of Trump, even calling the billionaire businessman a ‘‘cancer to conservatism,’’ but Perry lasted only three months in the race for the 2016 nomination before dropping out. Perry later endorsed the Republican nominee and said he'd be willing to work in a Trump administration. The former Texas governor was picked by President-elect Donald Trump Tuesday to run the Energy Department. In his first presidential run, Perry flamed out after a series of missteps. The one he forgot was, ironically, the Energy Department. The two others were Commerce and Education. Perry has drawn criticism from some environmental activists because he is on the board of Texas-based Energy Transfer Partners, the company trying to build a 1,200-mile Dakota Access pipeline that would carry crude oil from North Dakota to Illinois. The pipeline has sparked protests that have made national headlines. Perry also serves on the board of another energy firm, Sunoco Logistics Partners. He has been a vocal skeptic on climate change since before his first run for the White House. During his governorship, though, Texas became a major producer of wind powered-energy. Perry for years used economic incentive funds controlled by his office to offer tens of billions of dollars to wind producers and other companies promoting alternative energy. This year, Perry joined the board of a stem cell company where he underwent experimental back surgery before running for president in 2011. Perry had previously blamed chronic back pain for his ‘‘oops’’ moment and other gaffes that sunk his once-promising campaign, hinting that the procedure carried out by the Houston-based biotechnology company Celltex Therapeutics didn’t help him overcome it. But the former governor told The Associated Press this fall, after joining the company board, that his health was good and he was a big believer in adult stem cell therapy. Perry recently demonstrated his fitness with a brief appearance on this season’s ‘‘Dancing with the Stars.’’ He was the second contestant eliminated.